This edit presents a less political and more historically accurate version of Ridley Scott’s epic. Events, characters and motivations are made more ambigious, requiring the audience to think about them, instead of being told loudly and clearly how the film should be interpreted. 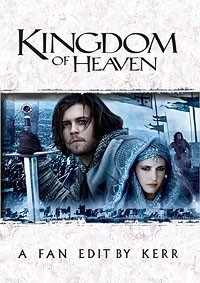 One of the major shortcomings of Ridley Scott’s “Kingdom of Heaven” is that it does all the thinking for us. The film’s message “Muslims aren’t all bad, Christians aren’t all good, we should all just learn to get along etc. “is hammered home far too often, and the audience isn’t given the opportunity to think for itself and draw its own conclusions. I think Scott and Monahan tried too hard not to offend anyone with their portrayal of the crusades, and ended up seriously offending the audience’s intelligence. Show, don’t tell. We don’t need characters to spell out the film’s message every fifteen minutes; we can figure it out for ourselves if given the chance. One of the goals of this edit was therefore to remove as many of these “morality monologues” as possible. Relating to the “show, don’t tell” principle, certain characters have been made a bit more ambiguous, in particular the characters of Sibylla and Saladin. These are both interesting and complex characters, but they’re both defined far too early as unequivocally good. It’s much more interesting if we’re kept guessing about their allegiance and motivations. In addition, the opening of the film has been changed. In the original, we expect a movie about the crusades, but spend 45 minutes in France and Italy before getting to Outremer, with characters we won’t see again (apart from the Hospitaller). For these reasons, I think it works much better to have the parts in France and Italy as a flashback, which I think makes them more interesting, instead of just making the audience wait for Balian to get to Outremer, they serve to explain how he ends up where he does. At the beginning, Balian’s character and situation are now a mystery, and the flashback to France is the answer to that mystery. - Cut Godfrey’s ‘Have you come to kill me?’� etc. DwightFry78 said pretty much what I feel, can’t really add much more. A damn good edit, more entertaining than the original but somehow still a bit boring. so I don’t think any fanedit can turn it into a masterpiece to me. so if you care for this story I think it is a must see. 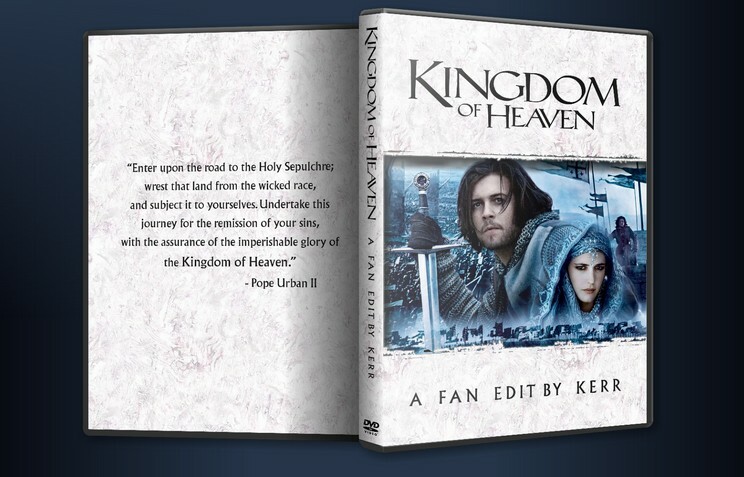 I had gotten the DVD of the original film (two-disc director’s cut) when I found out Kerr was fanediting it, as I had never seen it before… and I couldn’t finish watching it. I had to force myself to watch all of disc 1, then I decided my time was too precious for disc 2. It seemed to me like a desperate attempt by Ridley Scott to repeat the Gladiator Oscar sweep by delivering yet another self-important piece of junk food history, the kind the Academy seems to love so much. And that, yet again, depicts the 1200 as being the 2000s in different clothing. I repeat, I’m referring to the director’s cut, which is supposedly the “good” version. Guess I’m just not a fan of Ridley Scott (with the exception of his first three films). Still, since I’ve enjoyed Kerr’s previous output, I decided to give this a go. And while I still think it’s far from great cinema, and way too contemporary for my liking, I wasn’t nearly as annoyed this time around, which means Kerr has achieved a tremendous goal. I’m guessing most cuts have been performed to the second half, as, apart from the beginning being moved around, the only big difference I’ve noticed from the first half is the removal of Balian and Sybilla sleeping together, which already makes this cut a huge improvement. Yet it’s on the second half where I though the excitement actually kicked in. I do think Kerr should have removed more contrived modern behavior: the first thing that put me off the original was nobleman Liam Neeson APOLOGIZING to blacksmith Orlando Bloom for having taken advantage of his “first night right”. I repeat, a nobleman apologizing to a blacksmith. For exercising his given right. In the Middle Ages. Well, that moment puzzlingly remains in this version, much to my annoyance. Another example, which shows Scott’s total lack of subtlety: I thought Sibylla looking at her deformed reflection in that primitive mirror was a genius way to imply her being thinking of her deceased leper king brother… until Scott actually MORPHS the reflection into the face of the deceased leper king brother. Thanks, Mr. Scott, for calling your audience retarded. Too bad Kerr didn’t get rid of that either. Still, for all the garbage that remains, I was much more entertained by the whole thing than I thought I could possibly be. This being a Kerr edit, the nips and tucks were totally invisible, as usual. Video quality (DVD version) was pretty good, if showing slight blocking in several moments. Audio was fine. This is a good edit that deserves more attention than it has gotten so far. I give it 8/10.